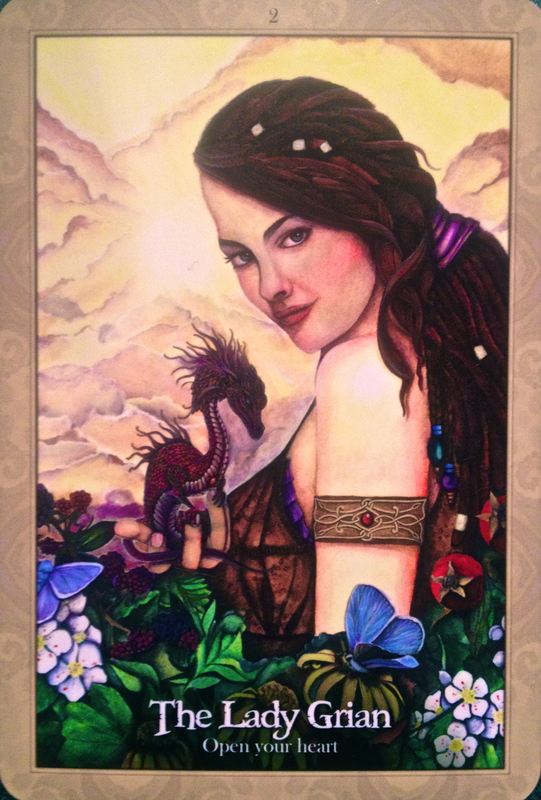 The Lady Grian ~ Open Your Heart: “I am of the Earth and of the sol-star’s light. I am the opening of the flower, the love that lives in the flower of your heart. I love you, and wish for you to draw this love energy into your being. I am a power source that you cannot neglect. Because even if you feel you are a being of winter, and that your heart has grown cold and hard in order to ease the pain, I tell you that you are now ready to reveal your own life source and warmth to another being. The love you have to share will be appreciated and returned. More so, this warm and loving heart energy will be its own reward, as you awaken again to your feeling nature. Please open your heart in this moment. Divinatory Meanings: “A time when dreams and wishes are quickly and easily realized. Fertility is accentuated, and your attractiveness and personal beauty are appreciated and commented on. Throw wide open your heart and experience the joy of feeling. Beautiful emotions, warm friendships, loving relationships. Displays of love – extravagant love. New projects and ideas. Self-love grows and attracts others to you when Grian is with you. You have worked so hard on yourself, and the seeds of your hopes, dreams and desires that you have planted are finally coming to fruition after much love and care. You have remained cautiously optimistic, now you can shake off the caution and meet life full on with confidence, exuberance and expectation! Love is… all around us! Love is everywhere you look, if you are present in the moment to see it. Love is attainable, it is real and powerful and tangible and finally truly yours to give and to receive. All you have to do is be true to who you are; there is nothing more special and unique than your authentic Soul self. It’s time to shine your light, turning it up to the max and see those around you gather around it’s bright white love and light. You are powerful. You are beautiful. You are Divine. You are worthy. You are abundant. You are joyful. You are connected to All That Is. You are LOVE. I AM powerful. I AM beautiful. I AM Divine. I AM worthy. I AM abundant. I AM joyful. I AM connected to All That Is. I AM LOVE.